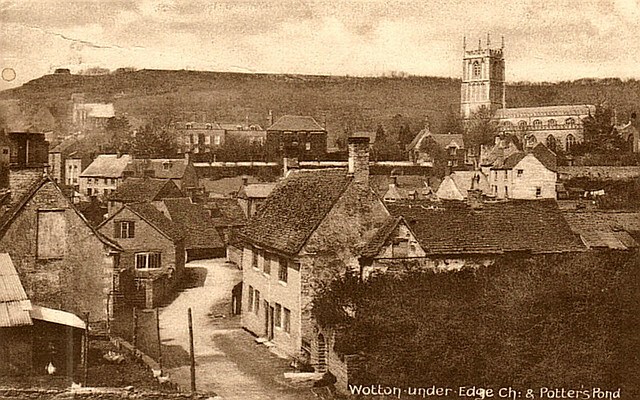 Above: A view of Wotton Church and Potter's Pond dating to around 1913. Top right: The Wotton band around 1970. 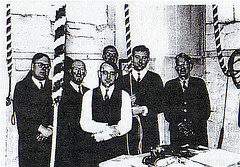 L to R: Michael Morley, Howard Ford, back Norman Martin, front Roland Cornell, Stan Sims, Stan Parker. 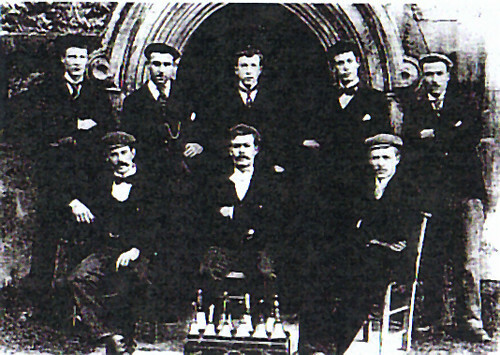 Right: Wotton ringers around 1900. Standing: Jim Parker, Sid Jones, Harry Plumb, Fred Oakhill, Harry Jones. Seated Tom Grimes, Jim Edey, Frank Webb. Hollow box-section iron headstocks with fixed steel gudgeons, ball bearings (1960), traditional-type wheels, Hastings stays and radius sliders all by John Taylor & Co. in 1902. Prior to 1902 a complete octave by Abel Rudhall with treble 6cwt 1qtr 13lb and tenor 17cwt 3qtr 9lb.